A ward at Maidstone and Tunbridge Wells NHS Trust (MTW) is handing out coloured and patterned blankets to elderly patients as part of a trial to help reduce falls. The first blankets were given to two patients on Edith Cavell at Maidstone Hospital last week and were received very positively by them and their families. 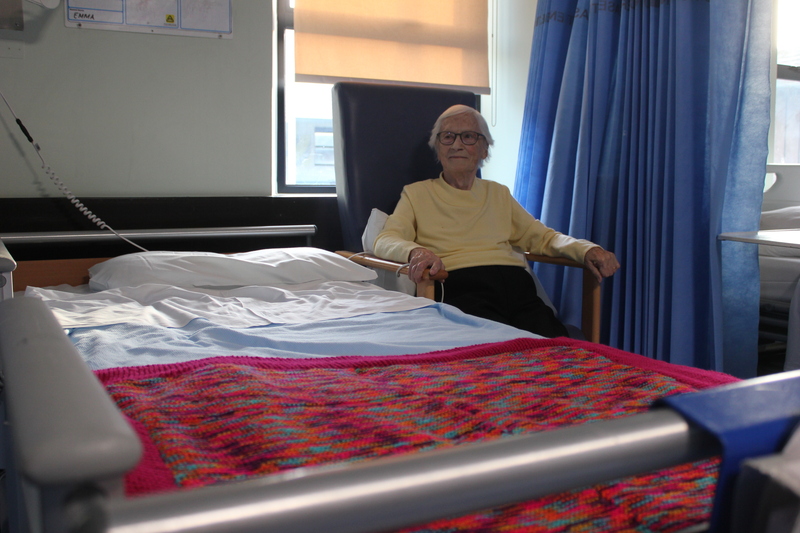 The blankets help older patients, particularly those with Dementia, find their way back to bed more easily. They also allow patients to see the edge of the bed more clearly, when getting out of and into bed, and provide a more homely feel to the ward. The scheme has been successful at other NHS hospitals and was picked up by the ward nursing and administration teams to trial at MTW. So far, nine blankets have been knitted or donated, and given to patients. Due to infection control, blankets are single use items and are taken home with the patient, following discharge. The ward team is now looking for people to help knit, or donate, more blankets. Anyone who enjoys knitting, or who belongs to a knitting group, or you have new blankets that you don’t need, please do get in touch. The blankets need to be brightly coloured or patterned and 3ft wide. There are no size restrictions with length, although please be aware some of our patients like to put the blankets around their shoulders as well, so shorter lengths would be preferable. For infection control, blankets must be knitted using new wool, or if you’re donating blankets, they must be brand new. If you’re interested in knitting for us, please email mtw-tr.blankets@nhs.net. New blankets can be left at our main reception at both Maidstone and Tunbridge Wells hospitals. Pic shows: Mrs Harriet Brady, 93.